Babies use an extraordinary number of nappies before they are potty trained and parents must safely discard disposable nappies, or be sure that fabric ones are thoroughly cleaned and disinfected before reusing them. It is really a simple matter, but you must take care of soiled nappies quickly and regularly or they will give your home a very unpleasant odour. Disposable nappies account for only a small percentage of household waste, but they are not biodegradable and experts estimate that nappies discarded today will still be sitting in landfills 400 years from now. While some environmentalists recommend that parents use fabric nappies rather than the disposable types, others acknowledge that the detergents and sanitisers used to clean fabric nappies pose risks to the environment, too. Ultimately, parents must choose to use the type of nappies that they prefer and no matter what they select, they will need to do something with the nappies that their baby soils. Soiled disposable nappies should be transported as quickly as possible to an outside bin so that their odour doesn't remain in the house. There are a number of manufacturers that offer products that wrap disposable nappies and seal them tightly to contain the odour until the opportunity arises to take them outdoors. Many parents, especially those living in an upper floor flat, find these products to be very helpful. Nappy services are widely available and offer a valuable and convenient service for busy parents. Most often, parents and other caregivers are asked to remove solid waste from nappies and store them in a tightly sealed container for pick up at a predetermined time. Upon pick up, the nappy service will trade the soiled nappies for a supply of fresh ones, clean and ready for use. To save money, some parents chose to launder soiled nappies themselves. As in preparing the nappies for a service, parents should remove all solid waste before laundering. Nappies should be washed according to their manufacturer's instructions, which may vary a bit depending on the type of fabric. 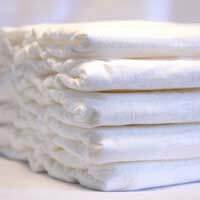 Frequently, nappies are all cotton and are washed in hot water using detergent and sanitiser. While many parents boil nappies or pre-soak them in diluted bleach, the use of some brands of sanitiser make bleaching or pre-soaking unnecessary. No matter what type of nappies that you choose, one thing is certain. By the time that your baby is potty trained you will have changed literally thousands of nappies. Thousands! Just thinking about that is enough to make you look forward to the day when your little one is using the potty!